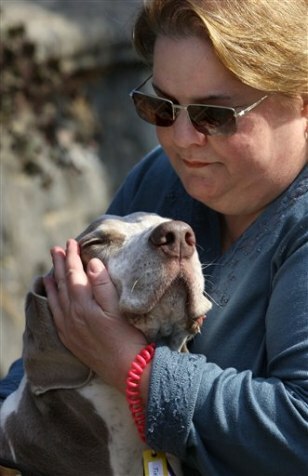 Kathy Rogalski hugs Gunner, 8 a Weimaraner she takes care of for a client in Tarrytown, NY Monday. Rogalski and her husband Jim of nearby Yonkers, both retired, bought a Fetch! pet sitting franchise a year ago.